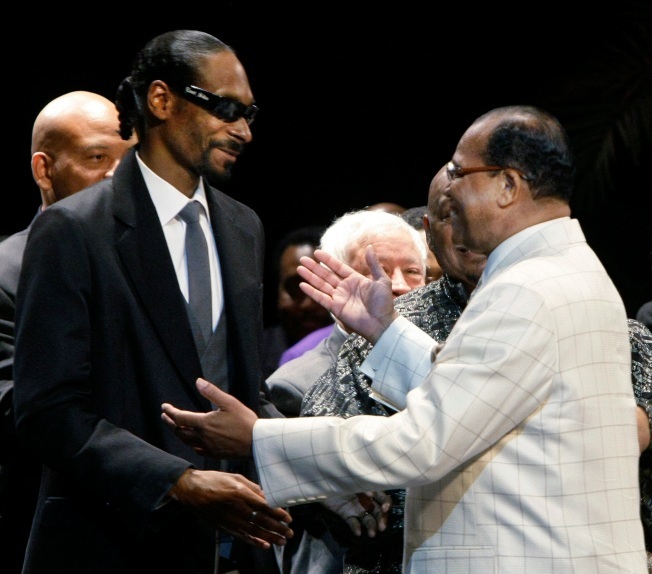 Rapper Snoop Dogg, left, greets Minister Louis Farrakhan at the Saviours' Day Convention in Rosemont, Ill., on Sunday. ROSEMONT, Ill. -- Snoop Dogg is one of several hip-hop stars making appearances at the Nation of Islam's annual convention in a Chicago suburb. Wearing sunglasses, a dark suit and a tie, Snoop Dogg spoke briefly in front of a crowd of thousands Sunday and praised the Chicago-based movement's Minister Louis Farrakhan. Farrakhan has long held relationships with famous rappers and hip-hop artists. Snoop, whose real name is Calvin Broadus, called himself the leader of the "hip-hop community" and says he'll always seek out the minister. Snoop gave a $1,000 donation to the Nation, which has espoused black nationalism and fought for black self-reliance and power. Rapper T.I., whose real name is Clifford Harris, appeared via recorded video.